The simplest option is Insert Default Measure: this simply inserts a new blank measure with the default count before the current measure, i.e. where you right-clicked. Insert > Default Measure After does the same thing, but inserts the new measure after the current one. It’s pretty self explanatory: select the number of new measures you want to add, and choose whether you want to insert them before or after the current measure. 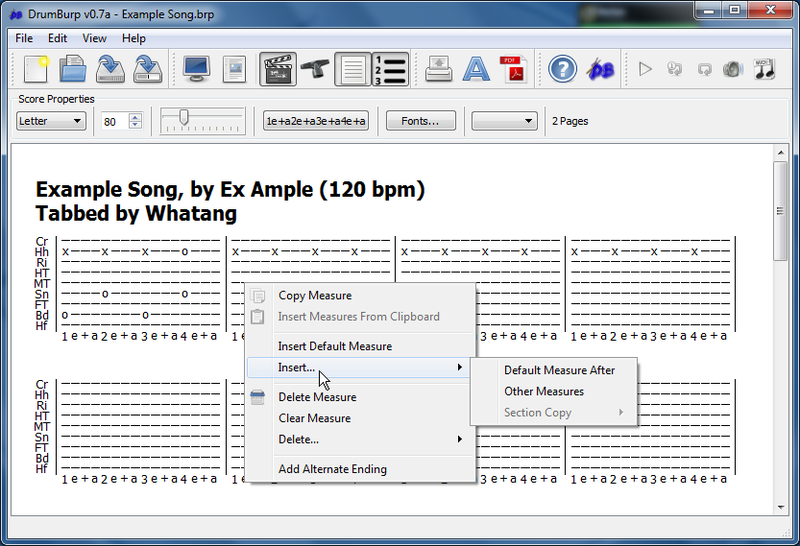 Then select the count you want the new measures to have, using the usual count selection interface: it will be initialized with the default count for the score. Hit OK to insert the new measures, or Cancel to return to the score without doing anything. 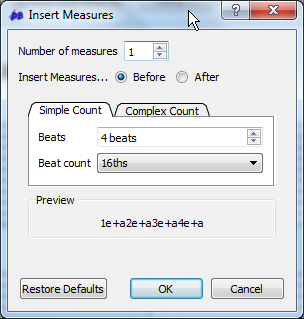 If you get lost at any point trying to edit the count for the new measures, Restore Defaults will reset the count to the default count. Drumeo Superb lessons and drummer community. DrumsTheWord A great (paid) collection of drum transcriptions with video lessons teaching you how to play each song.